Campaigners outside Fife House in Glenrothes. 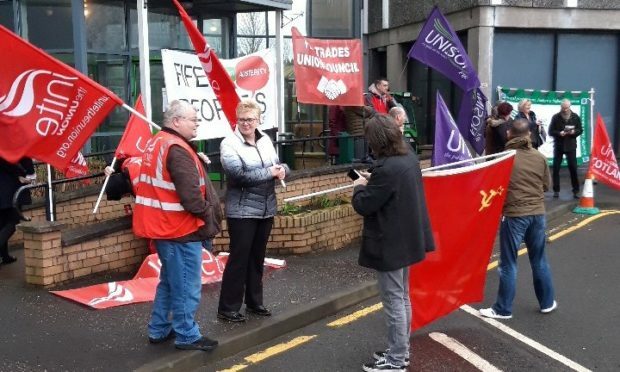 With around £4.8million of savings proposals expected to be approved by the local authority, members of the Fife People’s Assembly and the Fife Trades Union Council voiced their concerns about the impact of yet more cuts which could hit frontline services. Calling on councillors not to vote through the savings package proposed, Tam Kirby, spokesperson for the Fife People’s Assembly, said “enough is enough” and urged campaigners across Scotland to rail against what is happening. “We’re here, another year, because of cuts from the council, although they are sort of mitigated largely by the machinations of the Greens,” he said. “There’s still a cut to the budget here and there’s no need for a cut because this council has got reserves that would more than cover any cuts to any services here and buy them a bit of time. “We’re asking them ‘don’t put cuts through, use the reserves you have got’ for this year and start fighting back against the Scottish Government to get proper funding for local services, not just in Fife but across Scotland. “It’s shocking what’s happening. All local services across Scotland are now at breaking point and they can’t even afford even minor cuts. “Instead of ring-fencing money for their own pet projects, the Scottish Government should be helping councils instead of hampering councils. “It’s stopping councils from doing what they are supposed to be doing which is helping the most vulnerable in society.